The winter of 2011 - 2012 saw warm temperatures and an appalling lack of snow. This can be important to the club as snow in the Tug Hill supplies water to the Fish creek water shed when it melts in the Spring. Last year our shipment of eggs arrived in bad condition because of poor handling by the carrier. 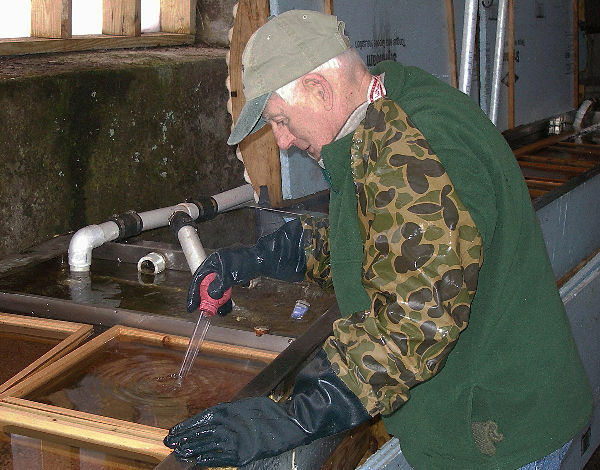 So it was decided by the club that we would transport the eggs and on January 5, 2012 one of our members, Paul Miller, drove to the Casco Fish Hatchery and brought back 47,000 eyed Atlantic salmon eggs by car the following day. 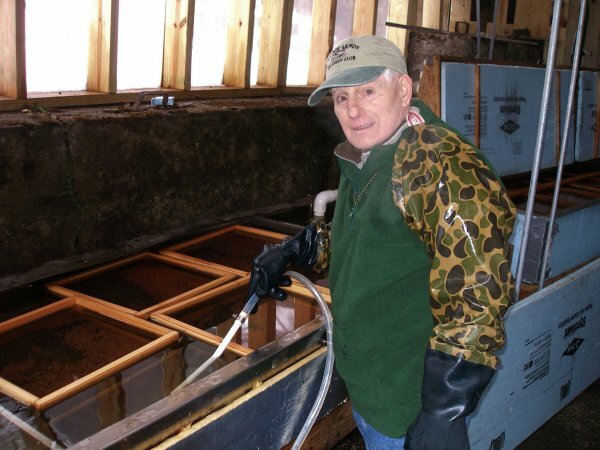 Club members visit the site each day to maintain the hatchery on a rotating basis. Mike is picking out bad eggs. The procedure is to identify the bad eggs and to remove them using a baster. Care must be used to not select good eggs. It is really important to remove eggs that have died or failed to mature as the eggs will decompose and a fungus will infect them and because the eggs are close together fungus spreads easily. Mike is wearing trappers gloves which protects his hand from the cold water. The trays float in the water and can be moved around to clean the tank. After picking out all of the eggs that have died, the next task is to clean the tanks. Mike is using a syphon to remove any debris found in the tank and the tank will be scrubbed if it needs to be. We often see aquatic life in the tanks in the form of nymphs or insects. This is the water supply which comes from the mill pond formed by the McConnellsville dam. 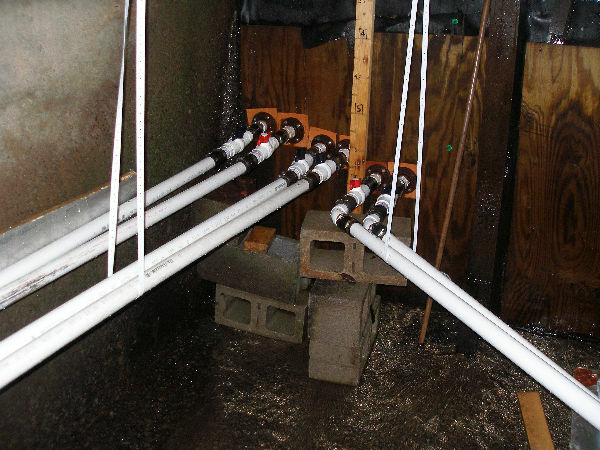 We have two pipes going to each one of three tanks in case one of them gets plugged up. There is also a valve which controls the amount of water flowing to the tanks. Before leaving the site certain information is recorded. The number of eggs or fish removed from each tank is recorded. A running total is also written down. 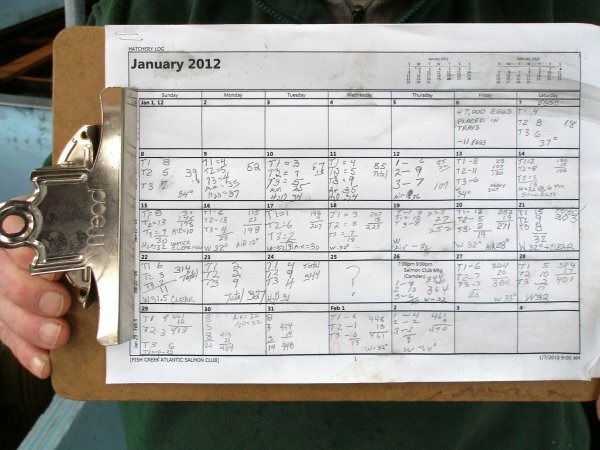 This allows us to determine if we have a problem and whether it is confined to a tank. The temperature of the water is also saved for future reference.